It all started when I realized that Paul Williams was on Daft Punk‘s latest album Random Access Memories. Paul Williams is an amazing songwriter. 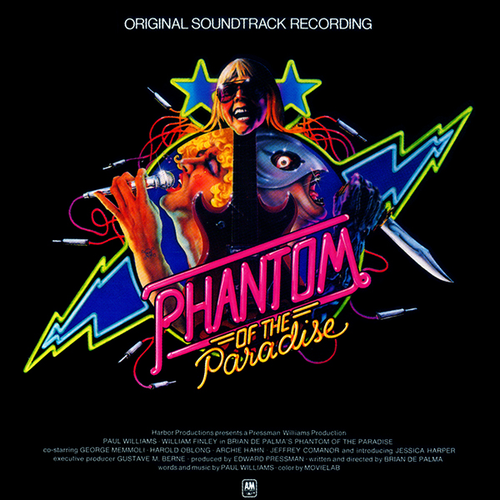 I discovered him listening to the soundtrack of Phantom Of The Paradise. The Daft Punk connection is obvious: The Mask/helmet. And that’s the hell of it. I’m convinced that I’d wind up burning too. We’re all born to die alone, you know, that’s the hell of it. Wow the lyrics… I hadn’t realised how dark they were. Even though I sang along to it mindlessly. the obvious weird suicide one was the opening track on the Album which was so catchy and fun! But used to make me feel weird. Would I kill myself and become an overnight rock sensation for my sister’s operation? Anyway, I could choose any song from this album. I really recommend you watch the movie and get your hands on the songs.